For this month's "Maps Of The Month" featurette, I wish to draw your attention to George s's Landstalker: The Treasures Of King Nole (Genesis) maps. Nigel, a treasure hunting elf, meets a wood nymph named Friday while she is escaping a band of thieves. Friday knows the location of the treasures of King Nole. Together, they set off on a journey to find this loot, which turns into a grand adventure. Doing more than just treasure-hunting, Nigel will traverse the land and become a hero to those along the way, if he survives several tricky dungeons filled with puzzles, traps, and monsters! And at the end is King Nole's Cave/Labyrinth/Palace which is quite a massive structure - I dare say, it might be foolish to go into this without George s's help! George s has been contributing a number of maps for a number of games lately, and one of his biggest contributions is a full map set for the Sega Genesis masterpiece, Landstalker: The Treasures Of King Nole. This isometric adventure is a standout on a console better known for arcade-style games - George s maps quite a number of arcade games himself - rather than fantasy epics, something you would expect on the Super NES, but we certainly don't complain about having some diversity! Besides that, it's considered one of the best games on the Genesis, regardless of genre. 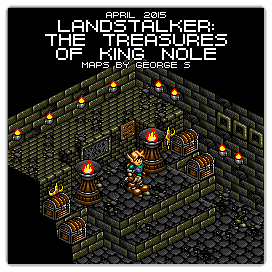 So to recognize the effort put into mapping this treasure, George s's Landstalker: The Treasures Of King Nole (Genesis) maps will be known as VGMaps.com's Maps Of The Month for April 2015. George s did a great job with this and it's always nice to see more isometric maps on the site. I just find it annoying that most games with isometric graphics (including this one obviously) have areas that are really difficult to arrange on a map in a manner that reads well. With Landstalker for example, outdoor areas are clear and easy to grasp, but dungeons quickly turn into huge messes full of rooms with lines and arrows going everywhere, and that's a fundamental problem for that type of representation, no matter how talented the mapper might be. And from looking around on the site, George s really does good work. TerraEsperZ your right about it being difficult to arrange. Most of my time was spent on trying to arrange as best I can without covering the art in thick lines. their probably are ways to make the map easier to follow but it wont be pretty.